NOTICE: Our office is closed indefinitely while we restructure the company. Thank you for your support and interest. To view a list of our products in PDF format, please click here! Product Information: Our foaming daily cleanser provides a deep cleanse without drying the skin. An organic blend of licorice, green tea, mint and aloe invigorates circulation as it breaks down debris and congestion. Instructions for use: Apply a pea size amount, add water and rub between palms to create foamy lather. Massage foam into skin for 1-2 minutes, rinse well. Product Information: This incredibly nourishing concentrate is a must for all skin types. It is a light (oil free) consistency with the ability to penetrate to the deepest levels of the skin replenishing vital nutrients. A plant source collagen, hyaluronic acid, squaline and aloe vera are packed with moisture and give an intense boost of hydration. Rosehips, horsetail, and green tea are strengthening and protect the skin. 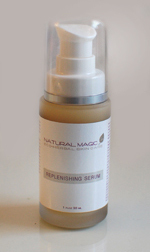 The serum includes a precious essential oil combination of frankincense, myrrh, carrot, chamomile and geranium. This combination has been used for centuries by royalty to increase circulation and cell regeneration. Instructions for use: On clean skin apply a pearl size amount over entire face and neck. Can be helpful to apply around eyes or any other areas of concern. Wait 30-60 seconds for serum to penetrate, finish with Pure Pearl Cream. Product Information: Our best seller and signature product! Experience the benefits of the highest quality pearl powder available. Our pearl powder is packed with a unique combination of proteins, trace elements and minerals. It can soften, soothe and replenish the skin. Our Pure Pearl Cream contains organic green tea, grape skin, Vitamins A, C, and E as active antioxidants and royal jelly to boost valuable nutrients. Chamomile, calendula and rose hydrate and soothe. Instructions for use: Apply o clean skin, or over replenishing serum. Lightly massage into face and neck. Enjoy the pearl-like glow. Consider using our Antioxidant Sunblock SPF30 as a final step for extra protection. Product Information: Our invigorating trio of fruit enzymes works with moisture to dissolve and remove accumulated dead skin cells leaving the skin soft and smooth. The enzymes also breakdown any oils blocking the pores to help prevent blemishes and congestion. Our Fruit Enzyme Exfoliant leaves the skin refreshed and more receptive to topical nutrients. This product includes a small spatula for easy and sanitary applications. Instructions for use: After cleansing the skin apply over entire face and neck. Leave on skin for approximately 10 minutes, massaging with wet fingertips into areas of congestion or dehydration. Some tingling is expected. Caution not to get into eyes. Rinse well. Product Information: Take time out of your hectic schedule to treat yourself like royalty and reinforce the effects of your daily skin care regime. Pure pearl powder, royal jelly and a plant derived collagen rejuvenate and replenish. Green tea, evening primrose and vitamin E all protect and strengthen. Essential oils of lavender, geranium, carrot, frankincense and myrrh are used to maximize the vitality and health of the skin. Our mask is a perfect treatment for discolored, stressed or malnourished skin; lightening, soothing and incredibly nourishing. This product includes a small spatula for easy and sanitary applications. Instructions for use: Apply to clean skin, cover entire face and neck. Leave on for 10-15 minutes, or can be left on as an overnight treatment for more dramatic results. Rinse well. Use 1-2 times per week, or as needed for desired results. Product Information: We are proud to announce our most intensive, rich moisturizer utilizing liposome technology. Ingredients known to invigorate and tonify such as raspberry, frankincense and grape skin are delivered deep into the skin. Using each evening as an overnight cream can have tremendous results. For those with very dry, malnourished skin it may be appropriate for day use as well. Instructions for use: Apply to clean skin, or over Replenishing Serum. Lightly massage into face and neck. Consider adding Intensive Eye Treatment to eye area for optimal results. Product Information: This deeply exfoliating mask is also very soothing and nourishing - providing dual benefits. 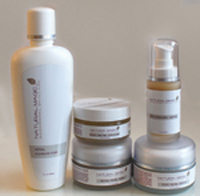 Creamy banana enzymes breakdown superficial skin cells while orange peel and lemon breakdown oils. Carrot, grapeskin and organic honey all build and replenish vital nutrients as organic aloe, calendula and licorice root soothe. An incredibly powerful and therapeutic herbal formulation. Product Information: A lovely body moisturizer safe for the whole family. Our body butter provides a rich concentration of nutrients such as coconut oil, shea butter, organic white tea, organic butchers broom and carrot root just to name a few. It is naturally fragrant with the addition of nourishing essential oils, bergamot and grapefruit. This product includes a small spatula for easy and sanitary applications. Instructions for use: Use spatula to remove a coin size amount of body butter. Massage in to skin well. Safe for the whole family. Product Information: This Intensive Eye Treatment addresses the special needs of the eye area. A powerful blend of rich plant oil extracts helps to treat fine lines and wrinkles and organic marshmallow extract is excellent to lighten dark circles. Our eye treatment can help to prevent the breakdown of collagen and elastin as well as protect from free-radical damage. For your extra protection there is a 23 karat mineral mica which provides nourishing minerals and assists in filtering UV rays. Product Information: Set of five Facial Bowls, perfect size for products. Product Information: Compressed sponges, set of two. Product Information: Facial Mask Brush that is perfect for applying product.